Seated and ready to be invested. It was rare to see so many student councillors seated in the school hall, being usually the ones orchestrating such a large-scale event. 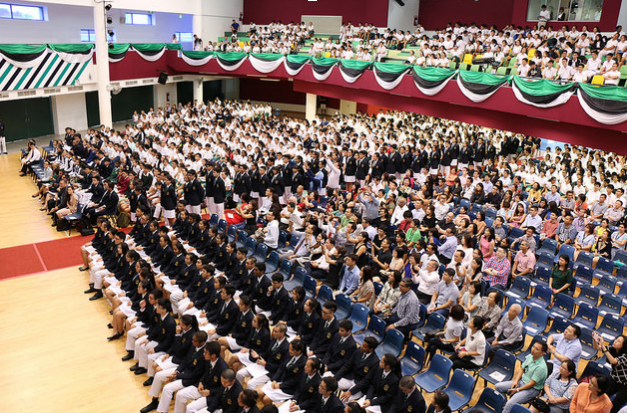 The 36th Students’ Council Investiture, however, had all of the Y5 batch, parents of the councillors and leaders from other Junior Colleges joining the occasion. The event celebrated the investiture of the councillors into their new positions. It also expressed gratitude for the the outgoing 35ths for the past year of service, empasising the illustrious legacy vested upon the incoming 36ths. It also expressed the sentiment and hopes for this batch to Bloom and to thrive in their leadership positions. The gratitude for the outgoing batch was evident from the start of the event, with a video made by the 36th Students’ Council to show their appreciation for their seniors. On the other hand, Guest of Honor and former Vice-President of RI’s 25th Students’ Council Dr Amanda Zain’s opening speech again stressed the importance for the 36ths to come into their own. She shared qualities that she felt necessary for councillors to flourish and bloom in their new roles: “strong roots”, in the form of support from family and loved ones; “grit” through hardness and tenacity, and finally “stamina”, manifesting in the ability to pace oneself and take time to rest. Freda’s speech highlighted the legacy left by the 35ths, and the big shoes they left the 36ths to fill in their new roles in Student Council. This sentiment was symbolically represented through the Blazer Ceremony, which was an especially poignant moment in the ceremony: the 35th Students’ Council helped their successors to put on their blazers, signifying the handing down of responsibility to the 36th Students’ Council, sharing a few words of encouragement with their juniors. This marked the beginning of a new chapter in Council’s legacy. 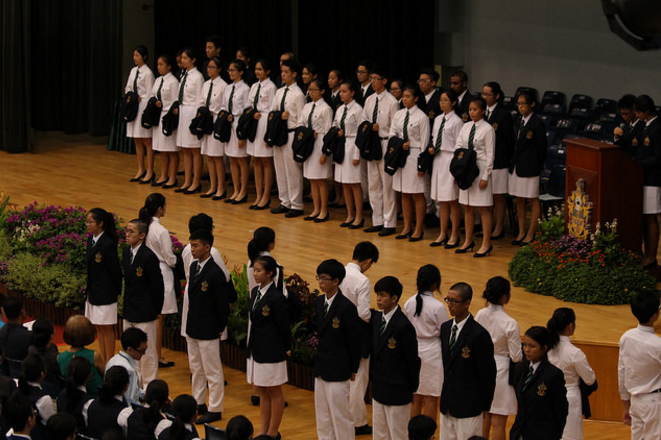 The Blazer Ceremony, which symbolised the passing on of responsibility from one batch to the next. 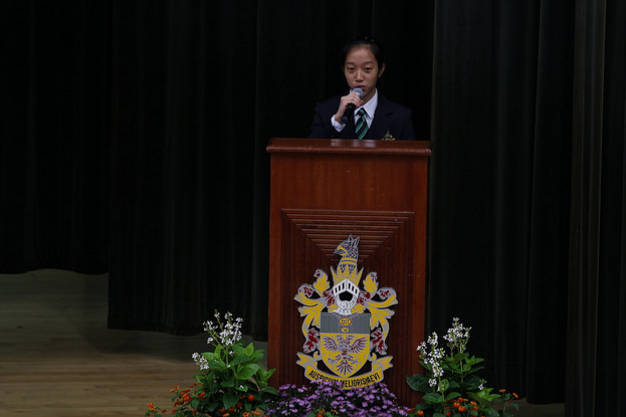 Blazers newly adorned, newly elected 36th Students’ Council President See Chung Yi (17S06F) stepped forward to deliver his first address, which reflected on his experience in RI (Year 5-6) so far. His speech focused on how how memories “shape us [and] define us” and acknowledged his positive experiences while promising to similarly improve the student experience as a whole. He ended by calling on the student body to “be the hope that we hope to see [and] to build the age we want to live in”. Following this, the incoming batch of Councillors were truly invested into their positions, with members of the different council departments taking to the stage to receive their Councillor’s badge. Each Councillor’s name was read out as they accepted their new badges before heading to the centre of the stage to recite the Councillor’s pledge as a batch, reflecting the great commitment, dedication and responsibility required of a Councillor in their service of the school. All too often, we forget about the people behind the scenes who make the magic work – who dedicate their hearts and souls to making this school a home away from home. This Council Investiture serves as a chance for us to acknowledge these hidden heroes who make Raffles what it is. 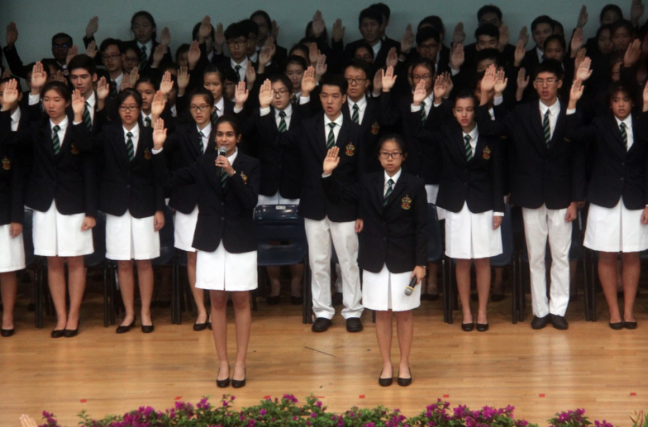 With that, Raffles Press wishes to congratulate the 36th Students’ Council on their Investiture and wish them smooth sailing as they embark on their year ahead.